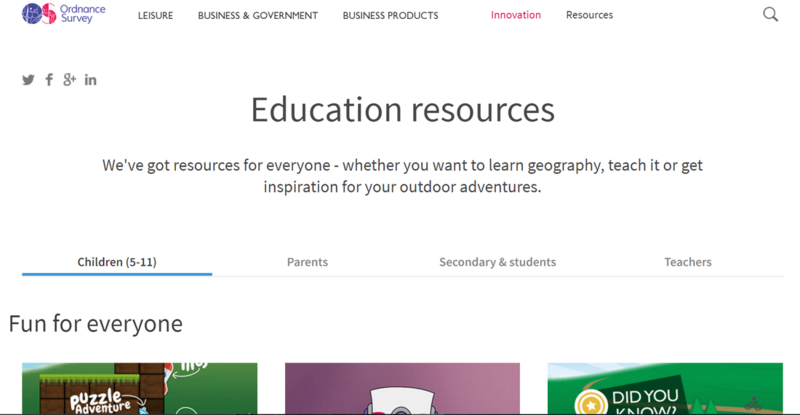 The Ordnance Survey website is based in the UK, but has an education section with kid-friendly games and activities that encourage students to learn and appreciate geography. Students are able to practice map skills, play games with geographical vocabulary, and use Geographic Information Systems (GIS) to learn about the world in which we live in. On the educational resource homepage, there is a tab for children (5-11), parents, teachers, and secondary students. The children 5-11 tab has eleven different games. These bright and visually appealing games engage students while they learn about map skills, map symbols, and colors on a map. This section also has some activity suggestions for going on an adventure outside. The website has recommendations for how to use Minecraft while learning about geography. The parent section has a place to buy paper maps of specific areas, an app suggestion for longitude and latitude and a homework help area. The teacher page has resources sorted by the age of students being taught. The secondary student page has games and activities that teach about election maps, grids, maps of coursework, adventure ideas, videos of reading maps, and downloadable maps of Europe. Overall, this website has a lot to offer an educator that is interested in teaching geography to a wide range of students.